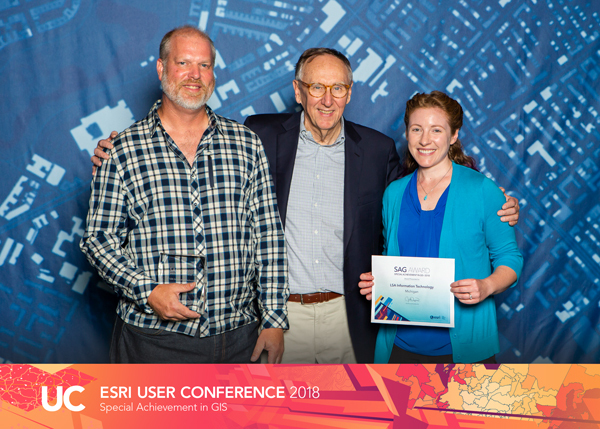 Esri, the global leader in spatial analytics, presented LSA IT with Esri’s Special Achievement in GIS (SAG) Award on July 11 at the annual Esri User Conference. Selected from over 300,000 eligible candidates, LSA IT received the award for its innovative application of mapping, data analytics, and thought leadership in higher-education research and teaching. The SAG Awards are meant to show appreciation for organizations that are using GIS to solve some of the world’s toughest challenges. Through “The Science of Where”—the technology of GIS combined with the science of geography—the users honored with these awards are demonstrating the most groundbreaking and transformative possibilities of GIS software. LSA IT was one of 180 organizations in areas such as commercial industry, defense, transportation, nonprofit work, telecommunications, and government to receive a SAG Award; only three higher-ed institutions we recognized worldwide. Esri staff annually nominate hundreds of candidates from around the world for consideration, and Jack Dangermond, Esri founder and president, selects the finalists.